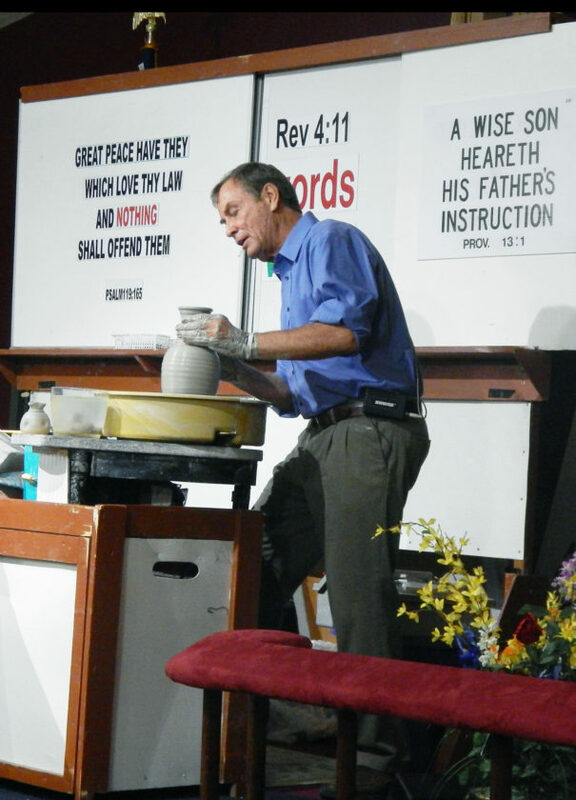 PHOTO BY JACOB GURNEY Evangelist David Engesath sculpts clay while preaching at a meeting at Truth Baptist Church, 566 N. Washington St., Wednesday evening. Evangelist David Engesath is to lead services at Truth Baptist Church, 566 N. Washington St., at 7 p.m. today and Friday. Sunday, he is to lead Sunday school at 10 a.m., a worship service at 11 a.m. with a potluck meal after, and a service at 1:30 p.m.
An evangelist who makes pottery while preaching is to present his message at Truth Baptist Church, 566 N. Washington St., this week. Evangelist David Engesath said just as an earthly potter puts clay through eight stages, from taking it out of the ground to firing it, God wants to mold and shape people and does so through eight stages. Engesath said that over the past 11 years, he has traveled to churches nationwide preaching about Christ and clay. While he and his wife, Diana, have traveled mostly to Baptist churches, they have been to all Christian denominations and mostly talk about the judgment seat of Christ, he said. Engesath said he began making pottery in the ’70s and he and Diana moved to Florida. He said the shop was “very good to them” but in 2003 he sold it after he “surrendered to the lord” and decided to go to Bible school in northern Florida. After graduating in 2007, the couple immediately began traveling across the country, he said. Engesath said he initially had one message but now has about 20 messages that relate to clay. The idea to combine pottery and religion came from Diana, he said. Diana said she is involved in the ministry and makes cards and speaks at women’s meetings at churches they visit. “I love my ministry and I am grateful the lord put us in this,” she said. Diana said she has published a children’s book, which she wrote for her grandchildren, and is continuing it as a series. All of her books are related to the material Engesath speaks about, she said. He said rushing the shaping process can have negative effects, just as it can with clay. “If I don’t process the clay correctly in the beginning and I try to make that vessel, it can break or warp or crack because it hasn’t gone through the stage correctly,” he said. Engesath said the Bible states that God is a potter who made people out of clay. In his own work, he said he makes different shapes of vessels and they coincide with different messages. He said he uses the same clay over again as he rewedges most of what he makes into something else. However, Engesath said he leaves a pottery creation at most churches. The Rev. James Martin of Truth Baptist Church said Engesath visited the church in the fall, but what he had to share couldn’t be done in a single day so he was invited back. He said the church decided to have Engesath back for a four-day meeting so he could go further in depth. Martin said that while his church is Baptist, members really are Bible believers who push the Bible, not a denomination. He said any religious organization that is made up of Bible believers, regardless of denomination, would want to have Engesath at their church. Engesath said he is not trying to show people anything that doesn’t come from the Bible, which is why he believes people are so accepting of his message. Engesath said he and Diana, who have been on the road since December, purchased a mobile home six months ago and plan to sell their Tennessee home soon. He said they enjoy having a house on wheels and it allows them to visit their grandchildren. “We love living on the road and going church to church wherever it takes us. We don’t charge anything for our ministry, but some churches take up a love offering,” he said. Engesath said it surprises them how many small, faithful churches there are in the country. “I go to churches with 50 to 60 people and that’s how a lot of them work all over the country as difficult as it is,” he said. “They’re so strong about their beliefs in the Bible and what God wants them to do, they are thriving even in a society where Christianity is becoming less and less tolerated. Diana said the couple has visited every state in the Lower 48 and there are many faithful people. “I am glad that we can be an encouragement to them, but I don’t think most of them realize they are an encouragement to us,” she said. Even their home church, Cornerstone Baptist Church in Carthage, Tennessee, has about 300 people who attend, even though it is a small town. He said one possible reason small churches are successful is that it is easier to be like a family. Engesath said the lord has taken care of him and his wife and they want to keep doing what he wants them to do. People interested in having Engesath speak at their church can call him at (850) 384-6191, visit his website at masterpotterministries.com or visit his home church’s website, sewingseedministries.com.